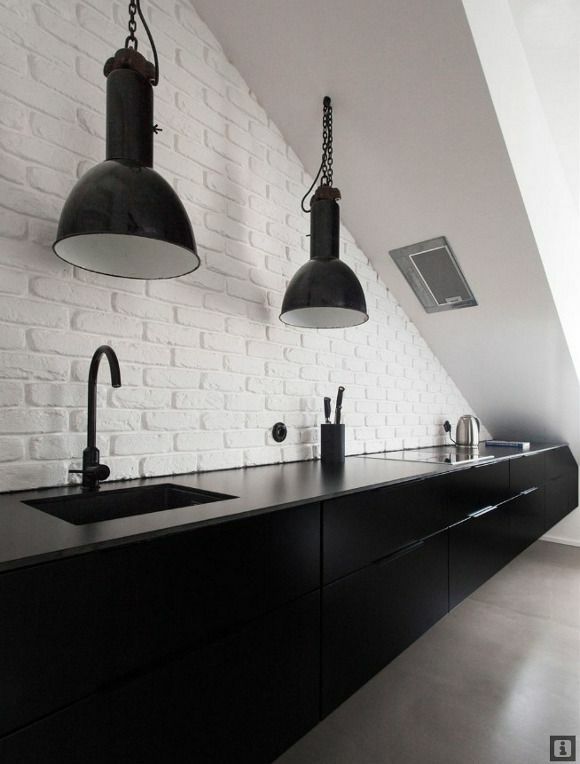 I am so into black kitchens, bathrooms and just about everything else including pottery. 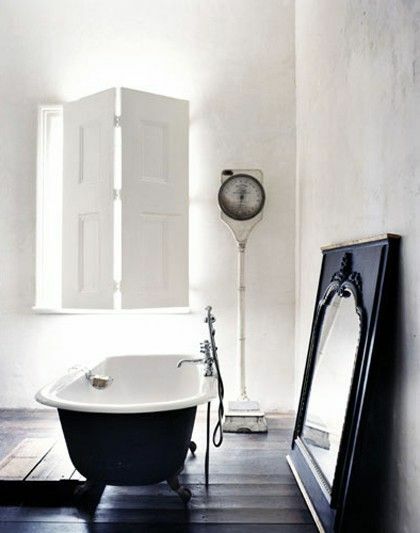 Not sure how someone that loves white so much could suddenly be so intrigued by all the dark decor out there but I am! 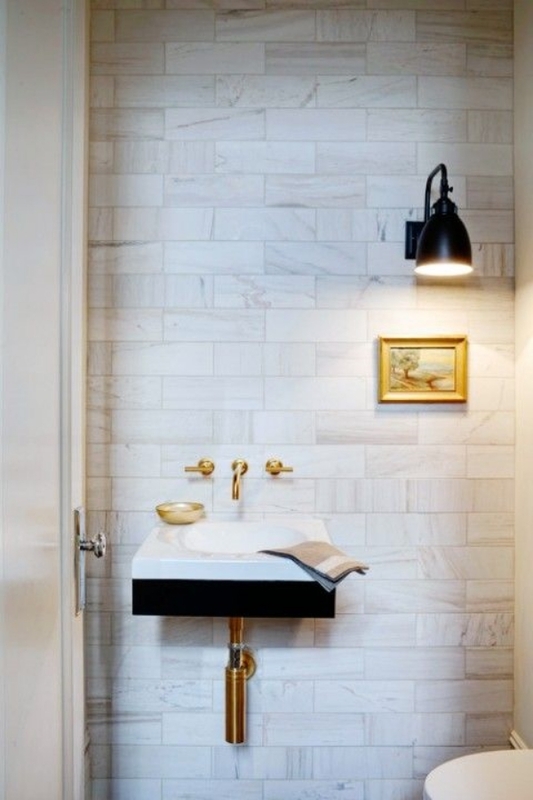 I also love black when it is paired with white and when it is paired with gold. 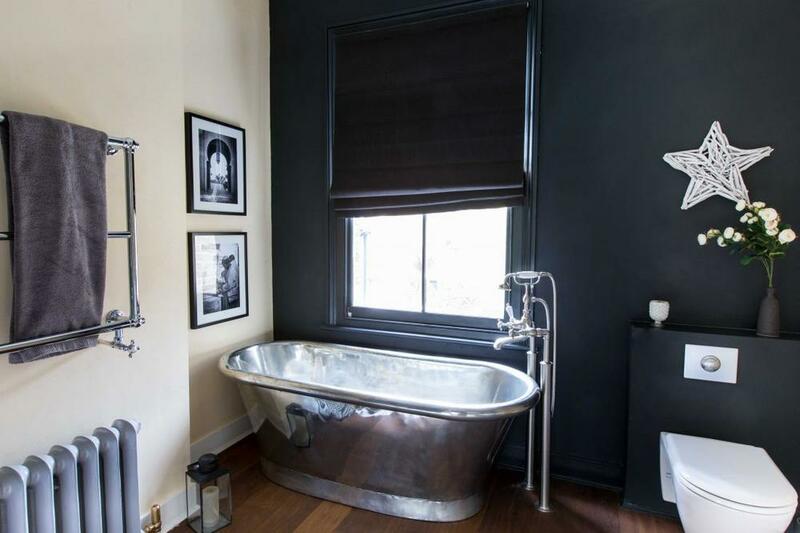 A touch of luxury to be sure. 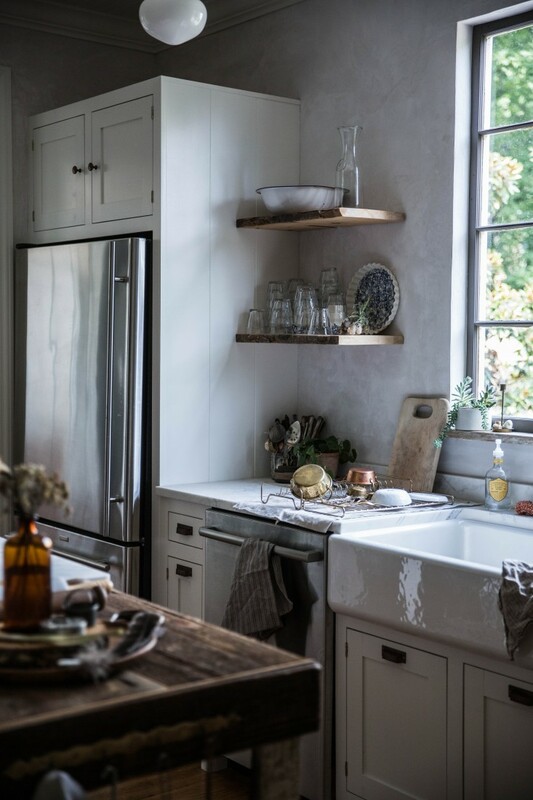 For those of you in the US I hope you are all having a lovely holiday weekend and did not spend too much in the stores today!! 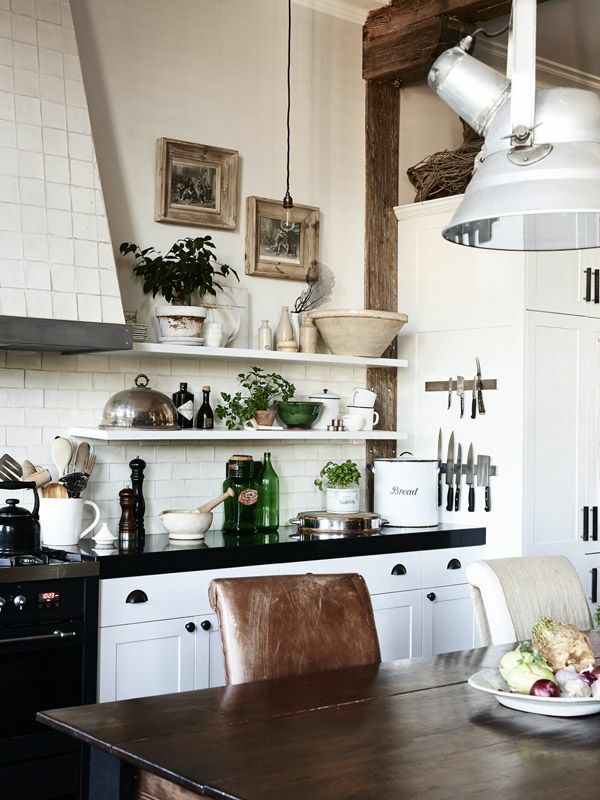 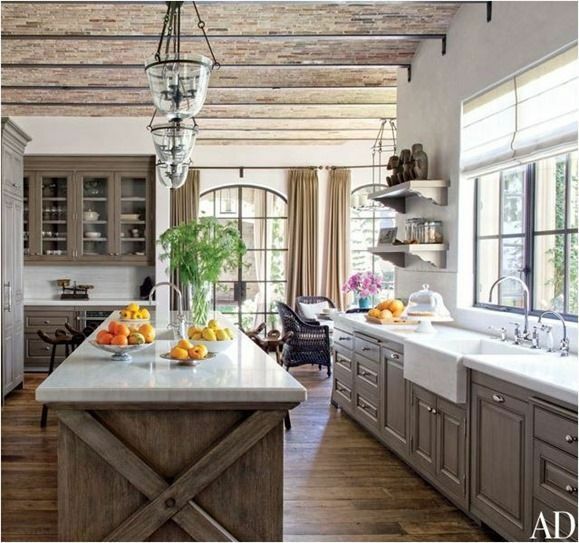 Now, it's hard not to love a rustic style kitchen. 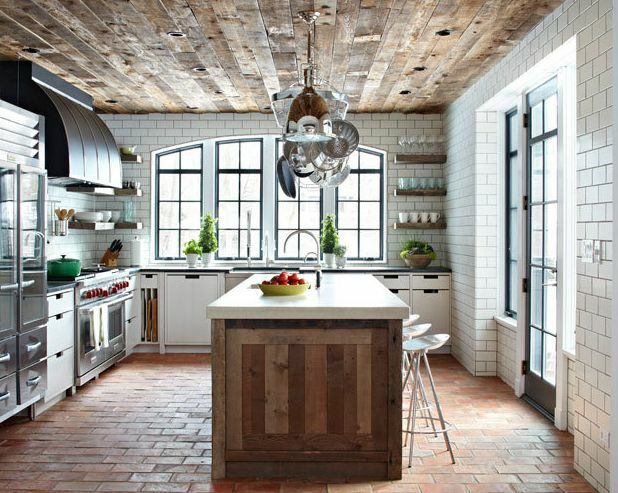 These have all the best elements of rustic style......wood, brick, rustic lighting, vintage accessories and even more. 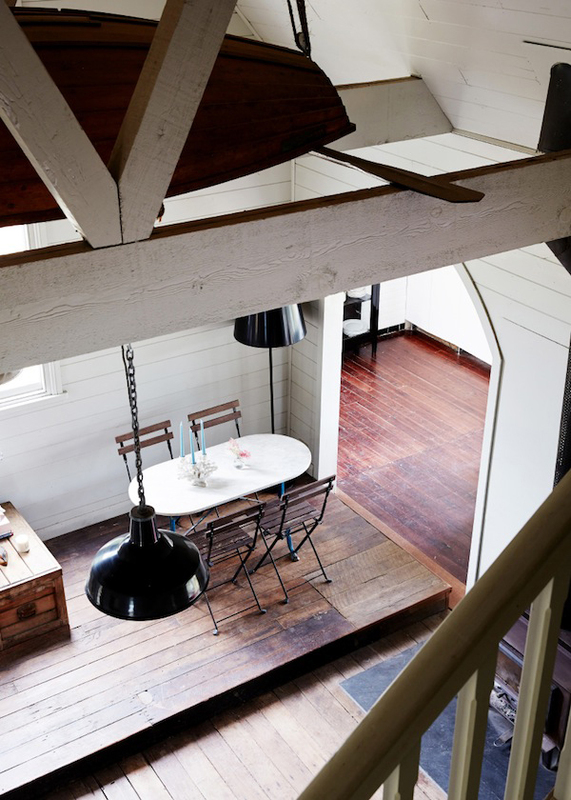 I love the wood on the ceiling in the first photo! 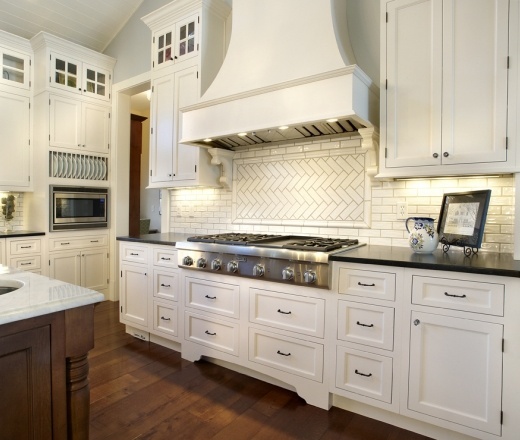 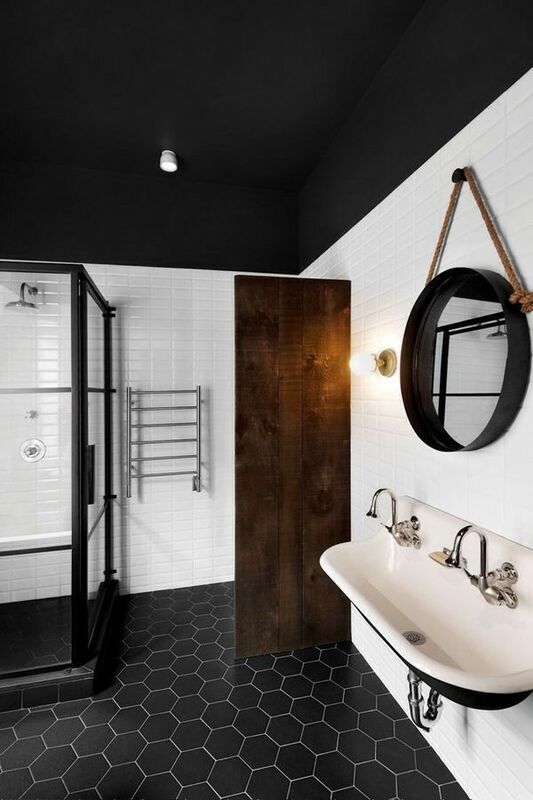 Looks amazing with the subway tile don't you think? 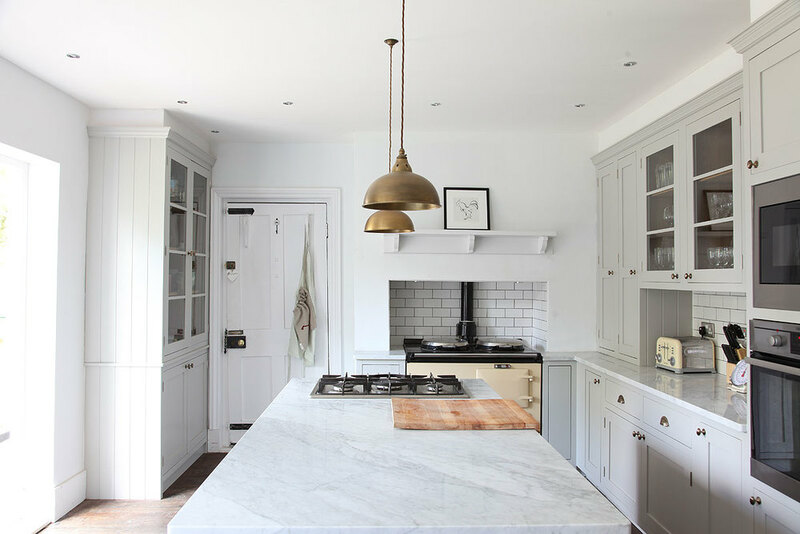 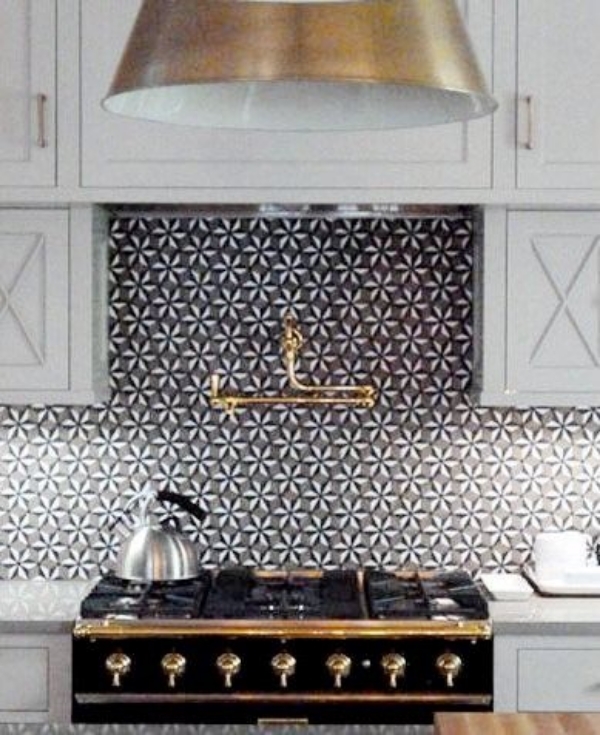 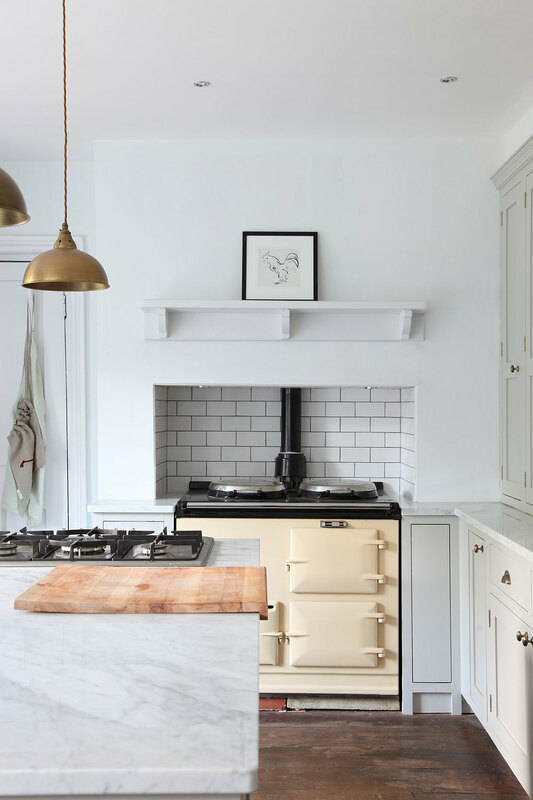 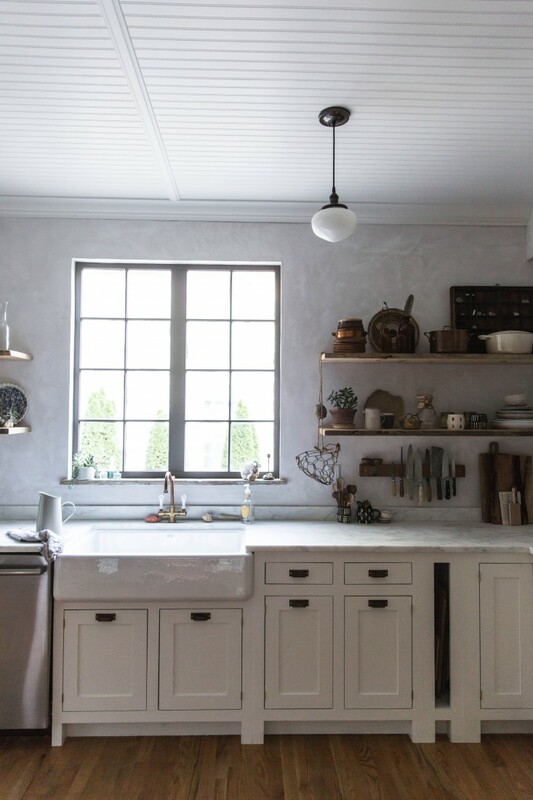 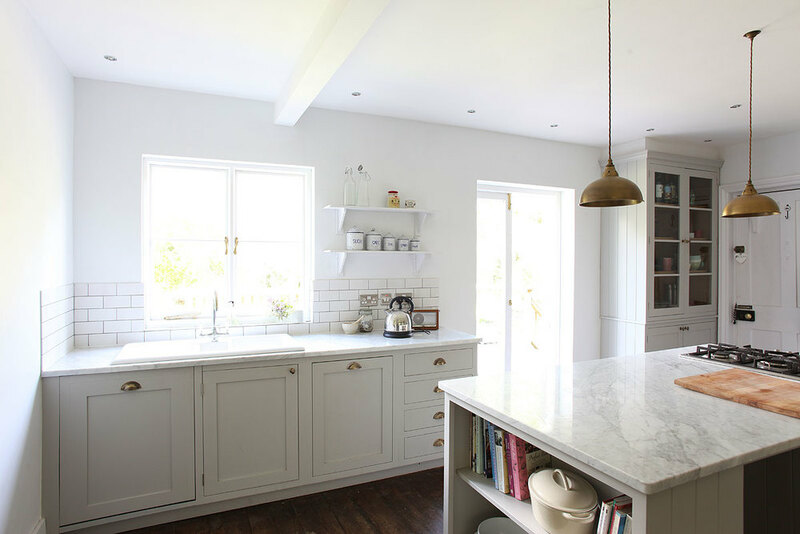 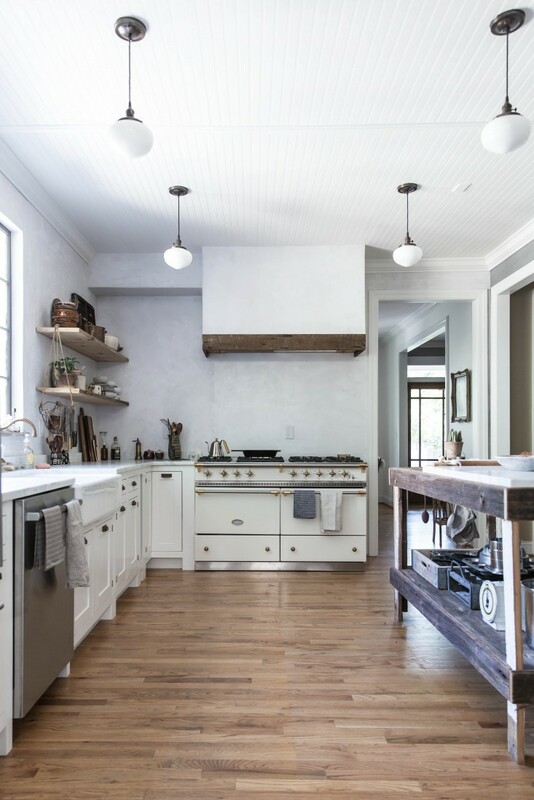 This renovated kitchen of the blogger/photographer Beth Kirby (Local Milk Blog) is a super wow....so many things to love about it...but the brass fittings are the best! 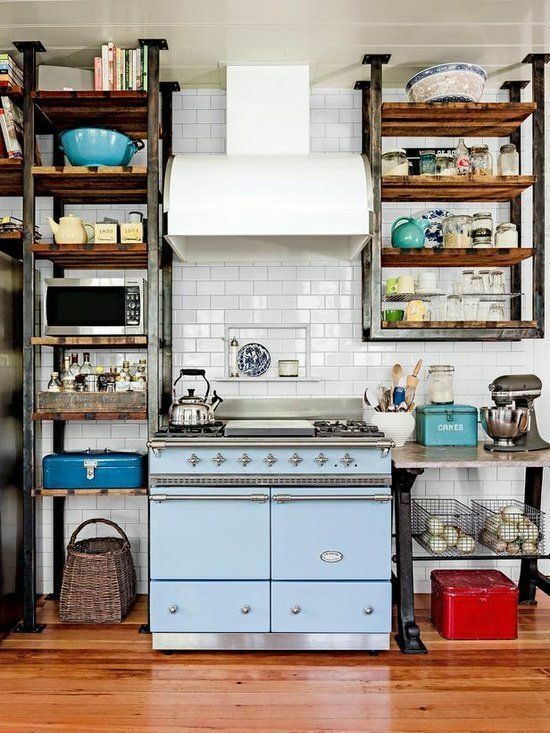 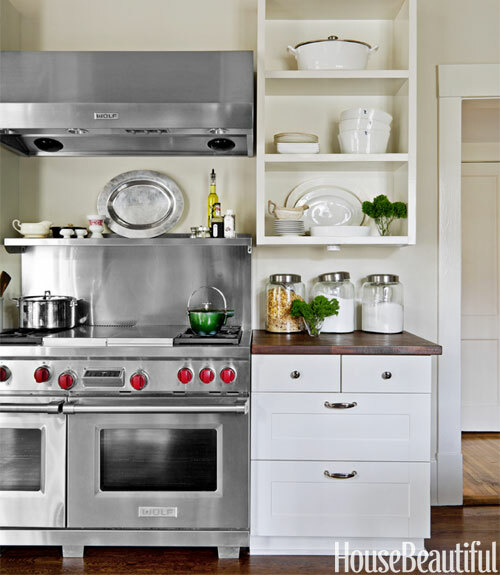 I love them along with that amazing stove and the farm sink. 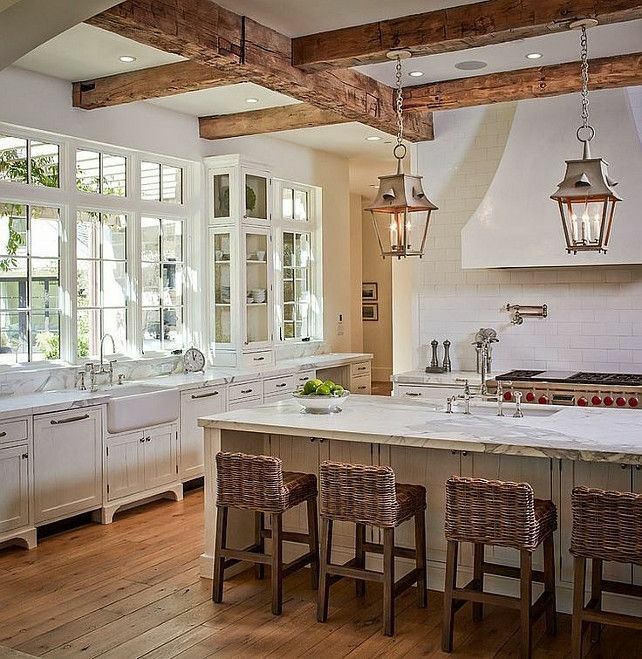 This feels like a kitchen to really cook in with family and friends. 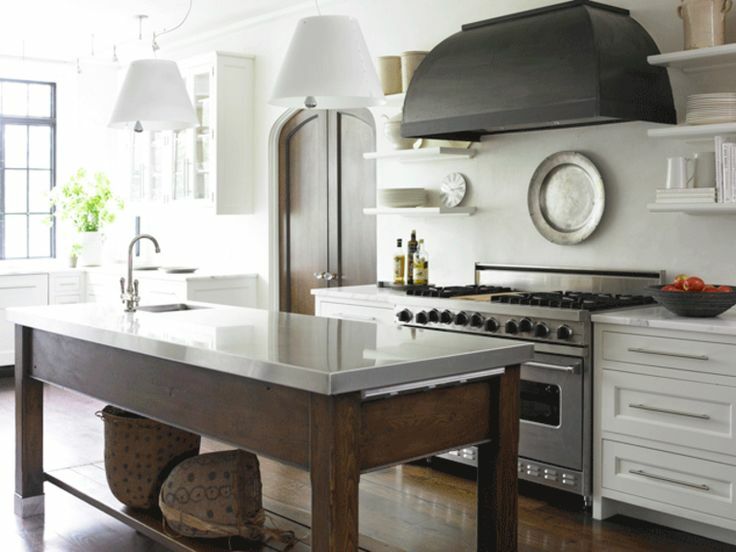 Not over styled or too fussy with a old wood island I can not think of a better design for a country kitchen. 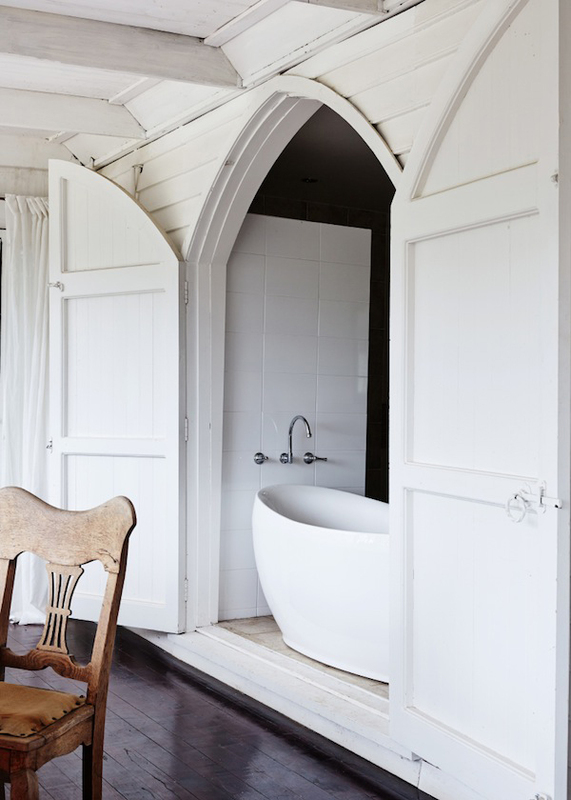 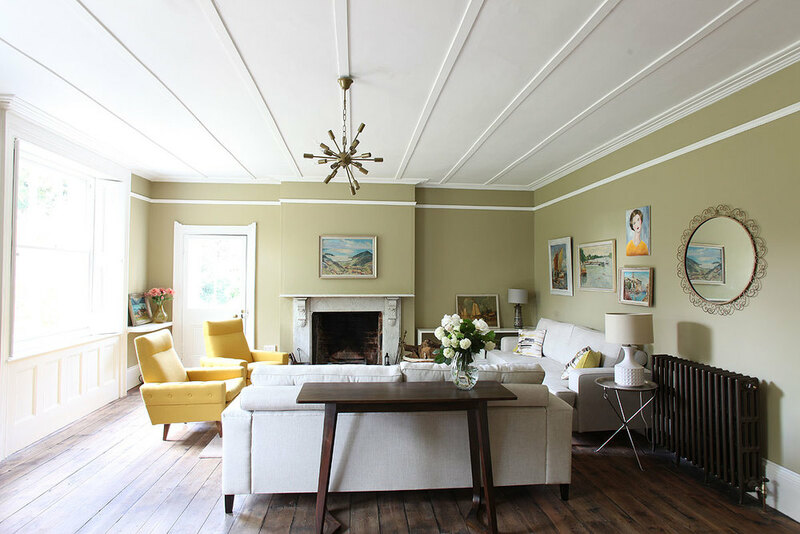 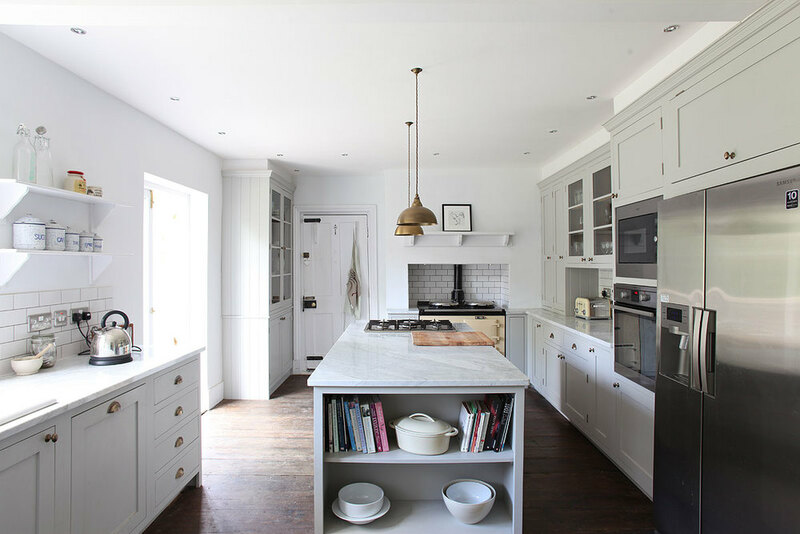 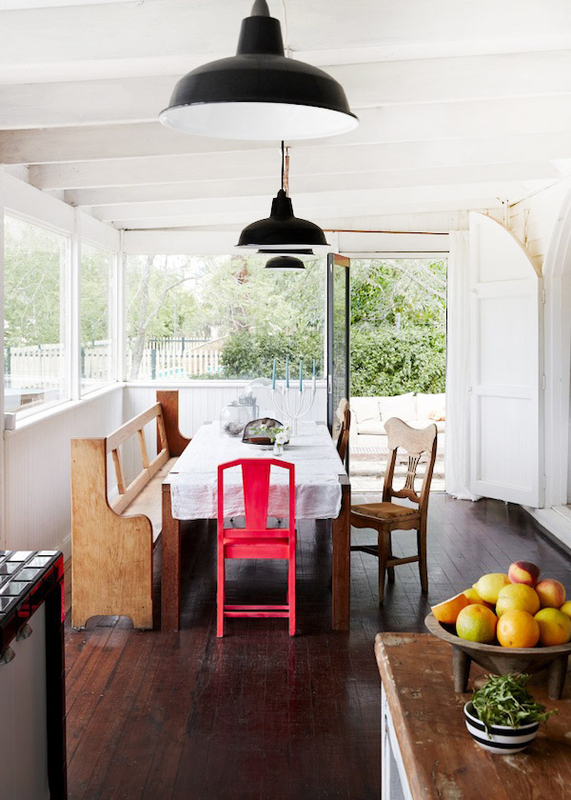 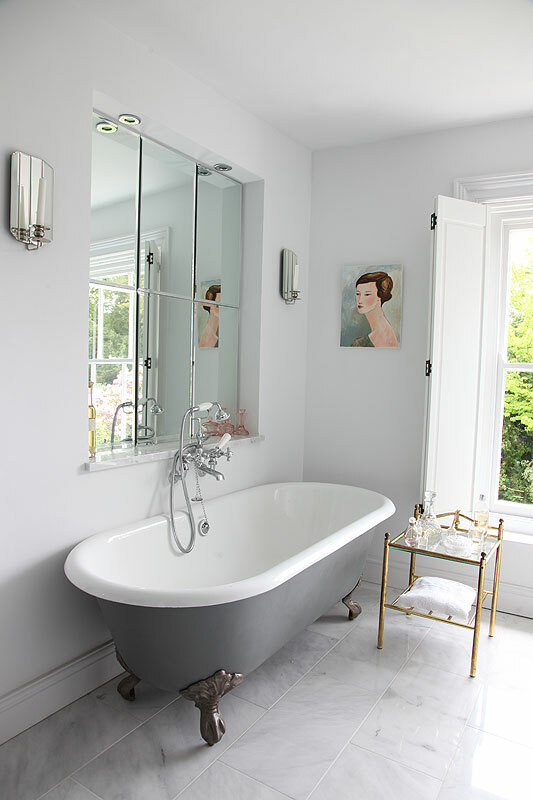 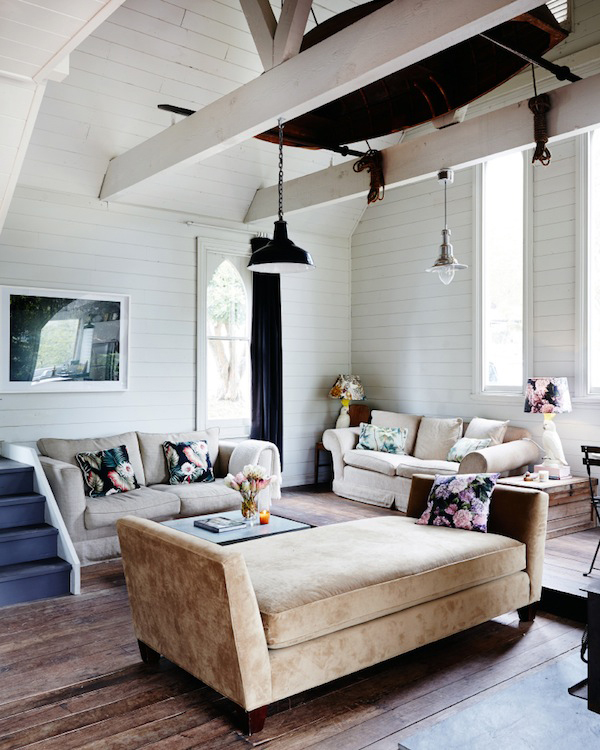 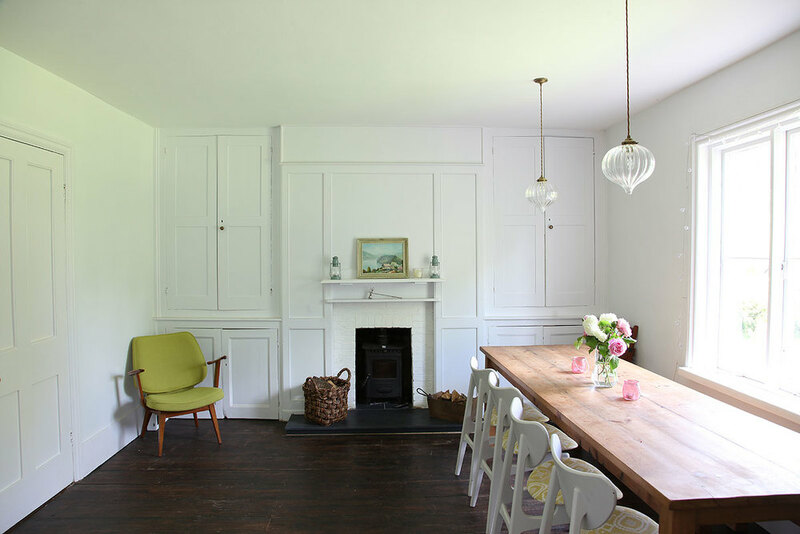 Go to Remodelista to see many more pictures.. and go visit Beth's blog! 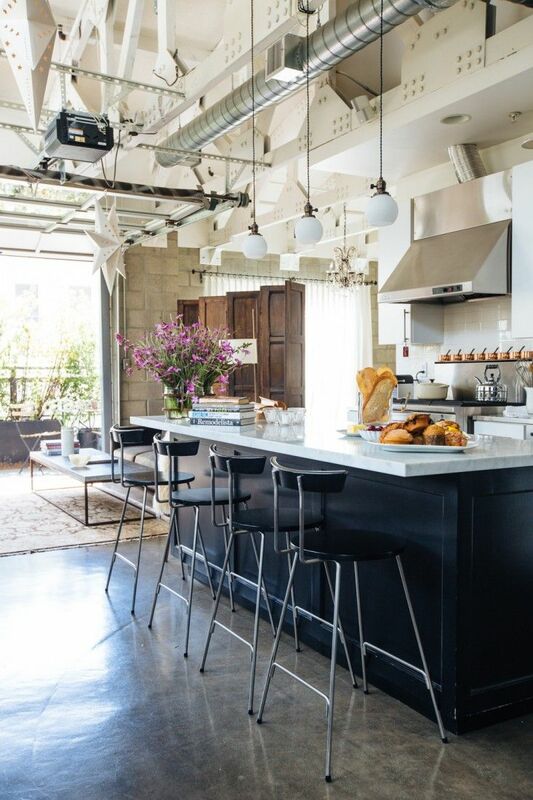 I have been a super fan of hers for ages!! 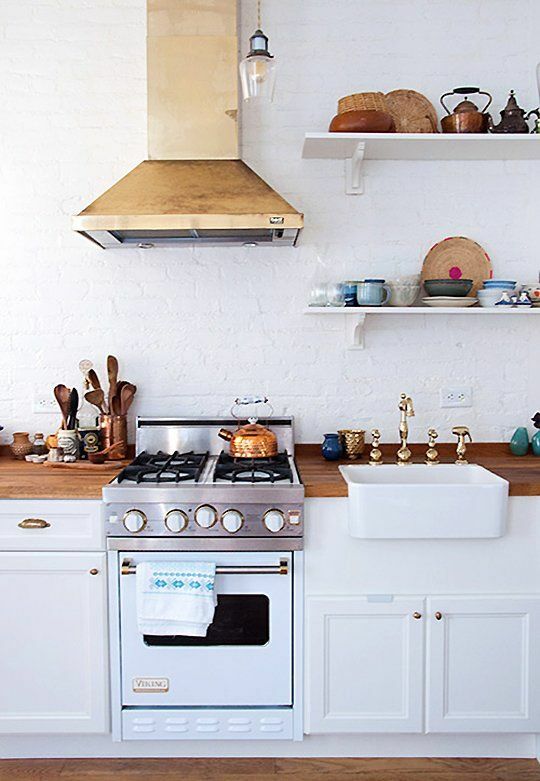 Okay now this is not a subject we talk about much but it's a good one......what about the silly fans we all have in our kitchen above the stove! 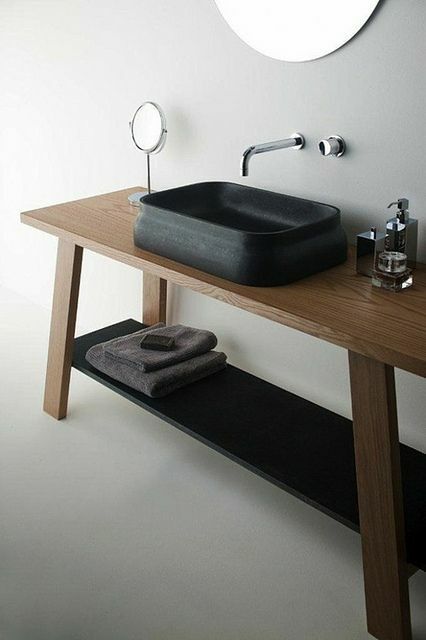 I know we need it but have you really looked at it? 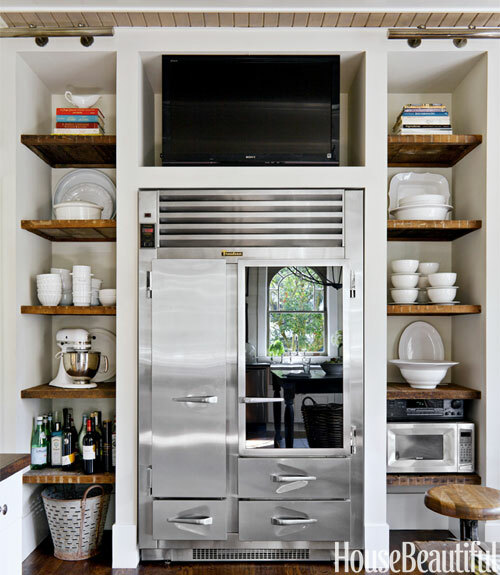 They rarely look good and so many people kind of ignore it....and leave the stainless steal boring old fan. 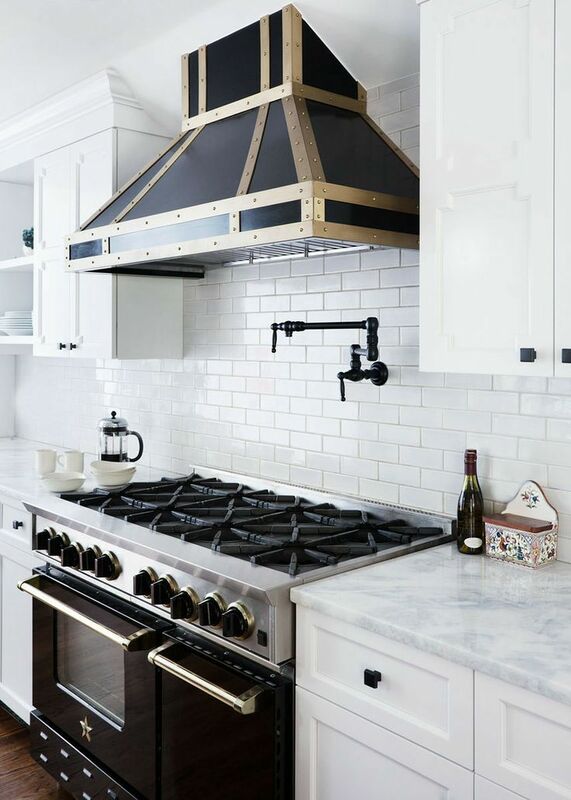 If you have a great kitchen designer though you can really make it interesting or at least unnoticeable...My kitchen hood is like so many where it is fully integrated into the woodwork and that is nice but some of these hoods below are quite lovely and even stand out in a good way...especially the brass one..lovely! 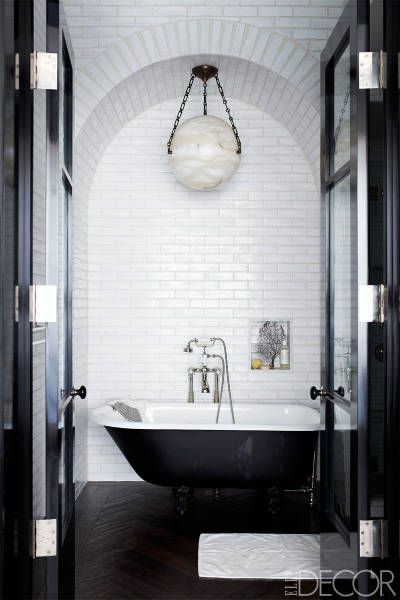 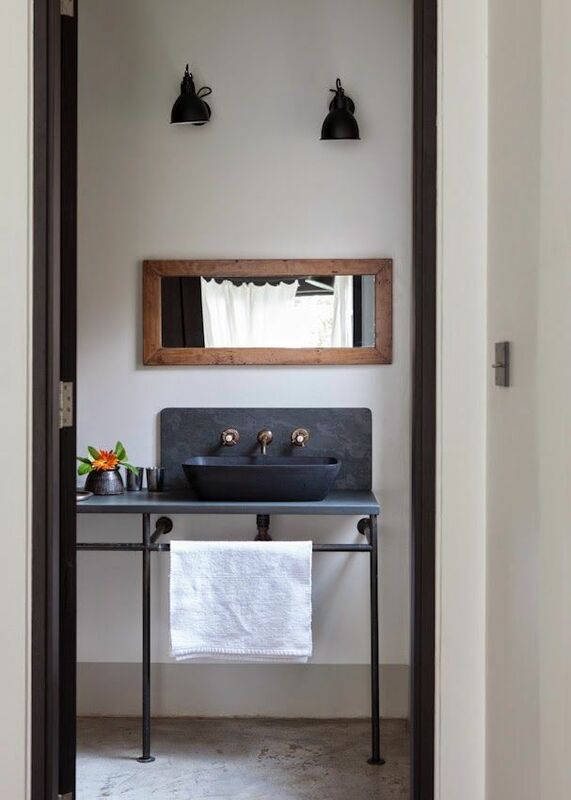 Black and white bathrooms are such a classic look but black sinks or tubs is a really bold choice. 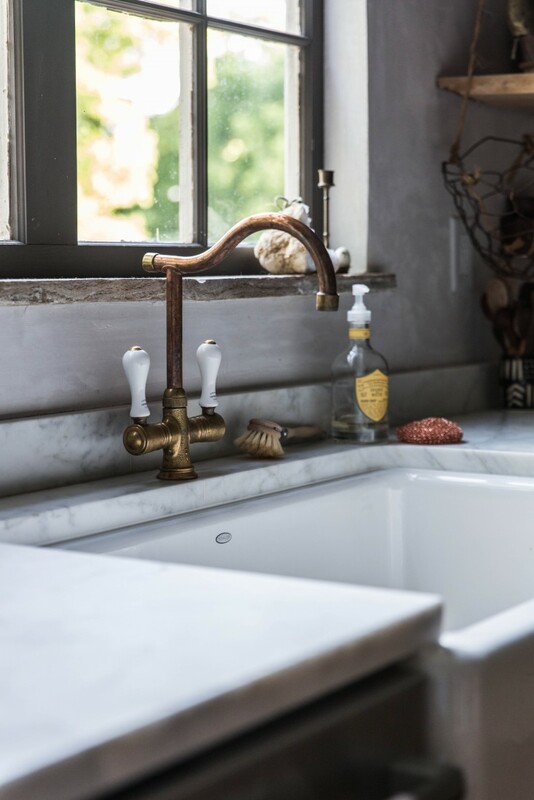 Not always easy to maintain but incredibly stunning there may be a tradeoff to make...so do not put one in your kitchen or bathroom until you are sure! 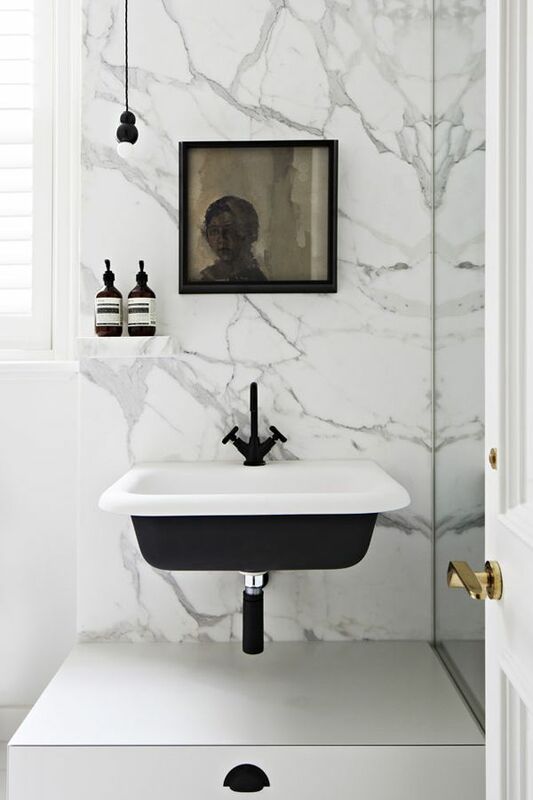 Having a white sink on a dark counter or a white tub with a black base though is a good way to compromise and get the look. 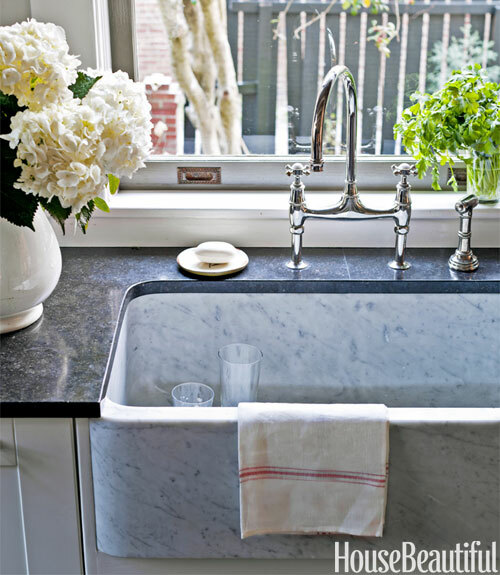 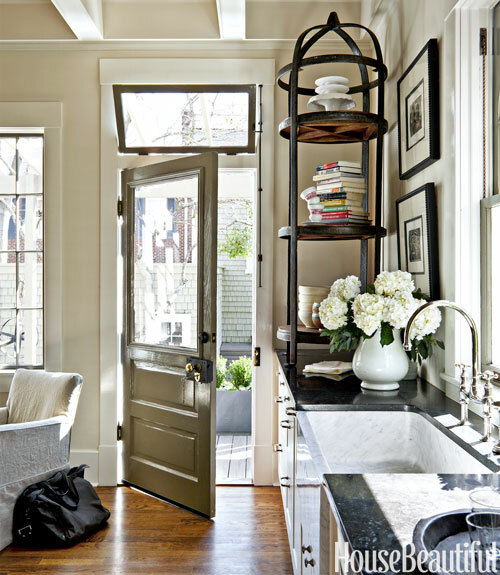 The washstand look of some of these sinks is also a fun new way to go in a more casual space. 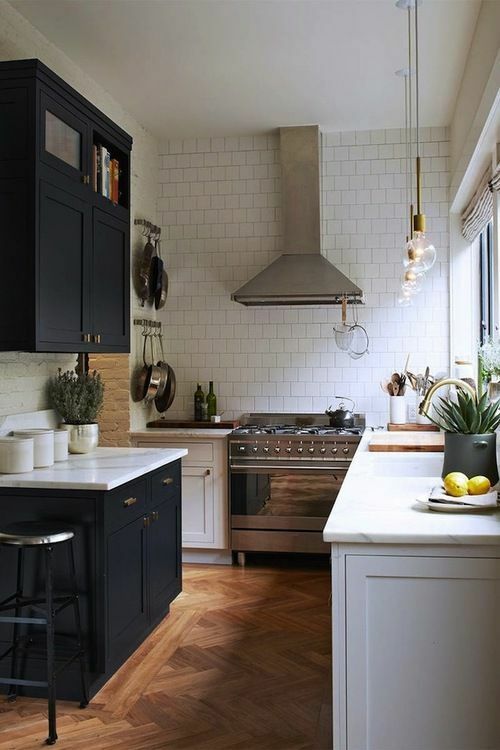 I posted about moody rooms the other day and as I was going through Pinterest I saw so many black kitchens....and you know what..I love them. 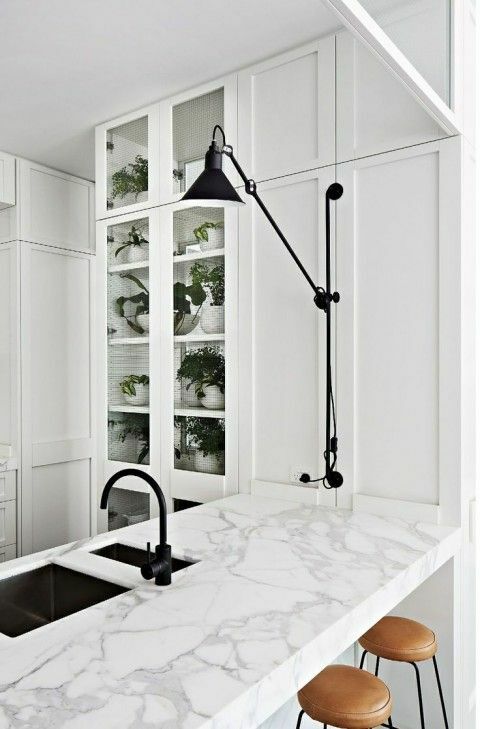 I always design white kitchens and in my own home I can't wait to make my kitchen all white...but that being said there is really something to combining the look. 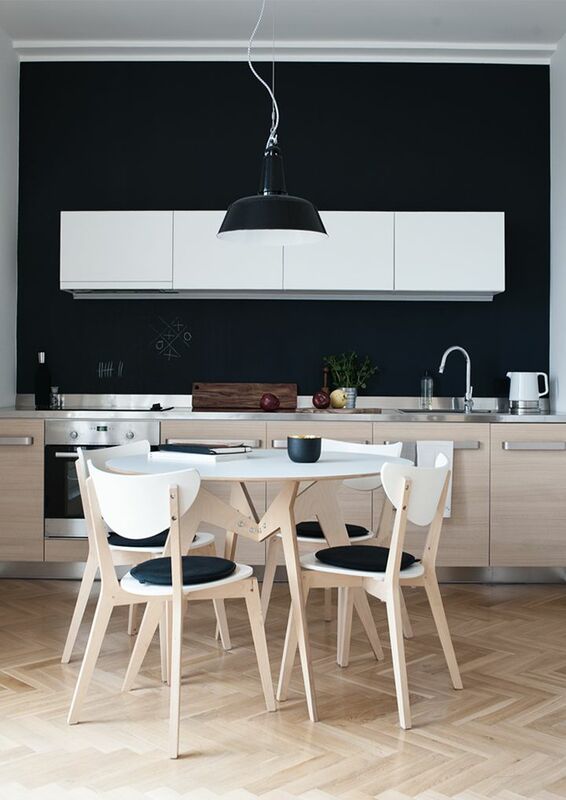 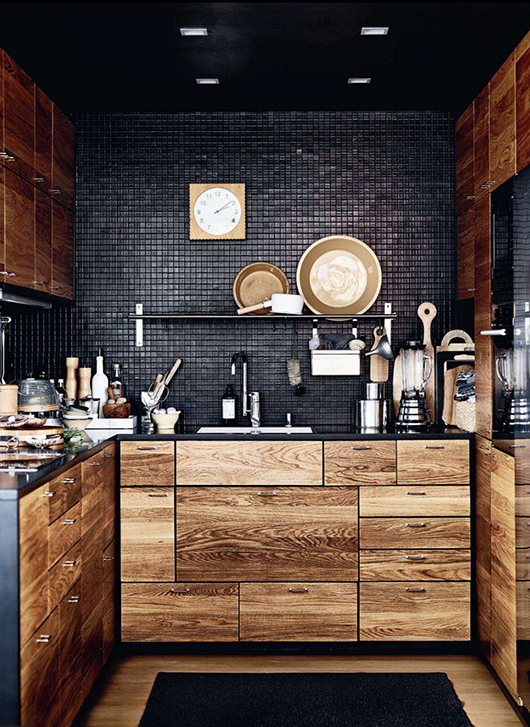 The black cupboards with the white backsplash is super sophisticated and what about the natural wood cabinets with the small tile in black. 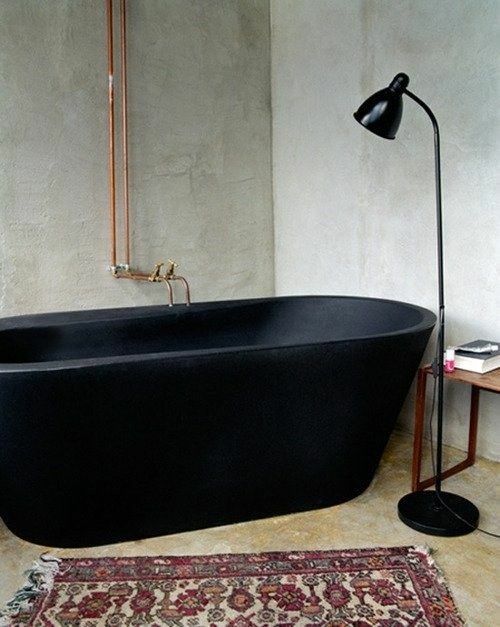 that is not a combination I thought I would like but it really works here. 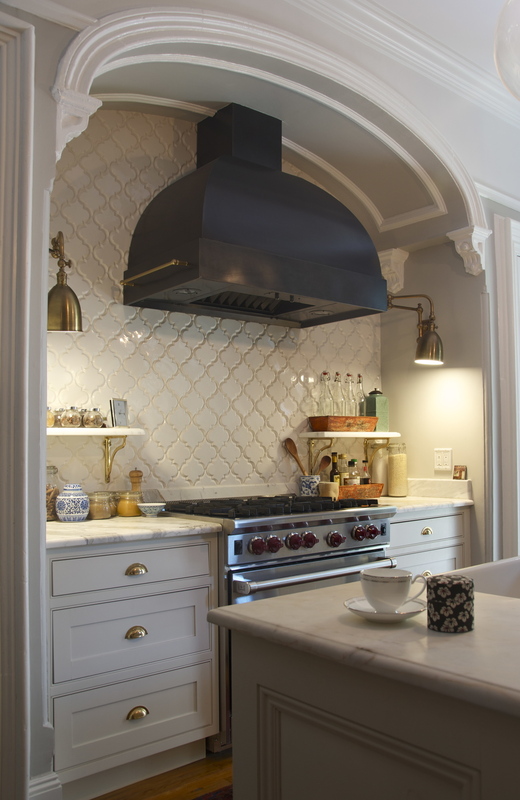 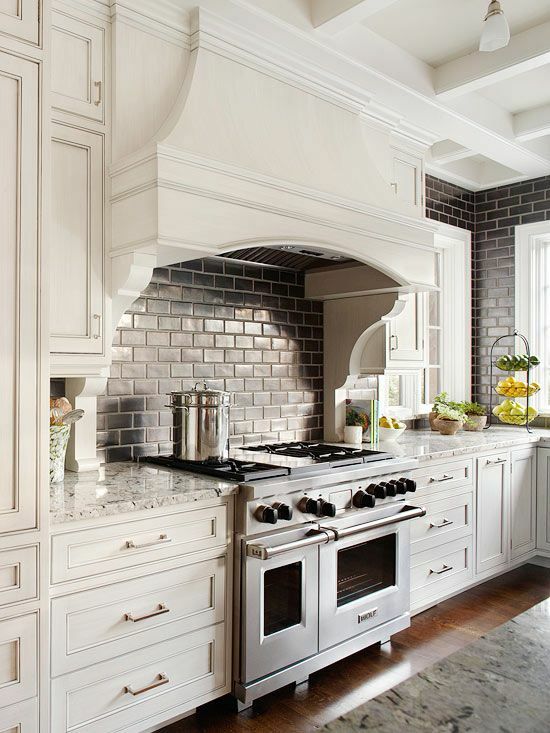 Pretty little kitchen with a French Country twist. 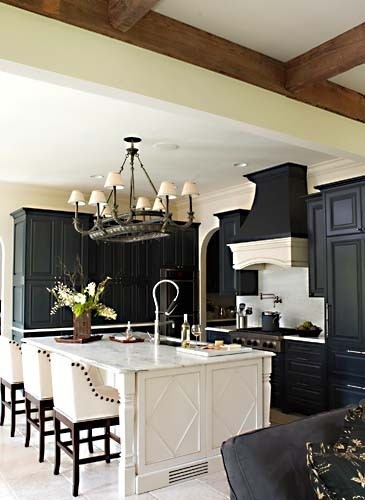 The amazing chandelier really makes a statement and seems very oversized but that is what I like about it! 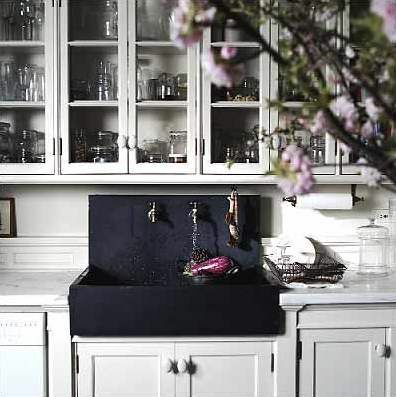 The sink in Carrera marble is another special element in this gorgeous kitchen. 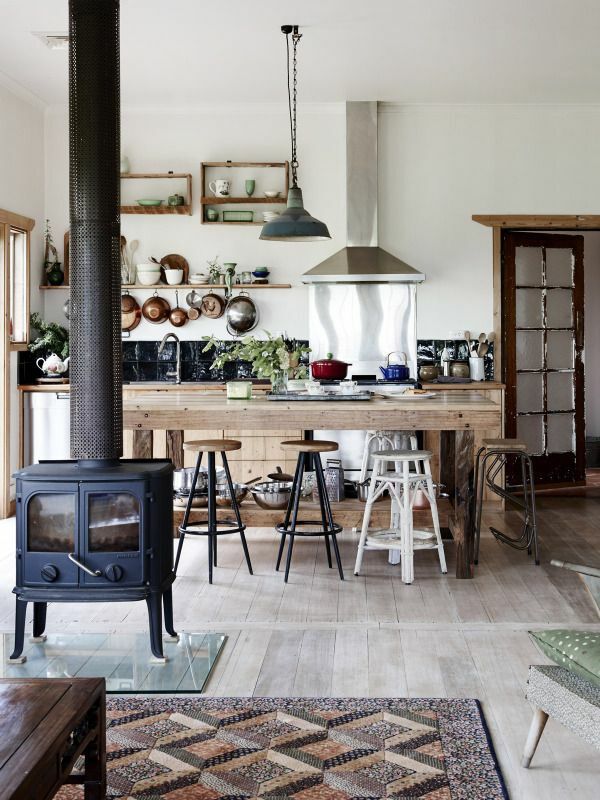 A superb fridge and this great stove with red controls just to add that extra touch of colour! 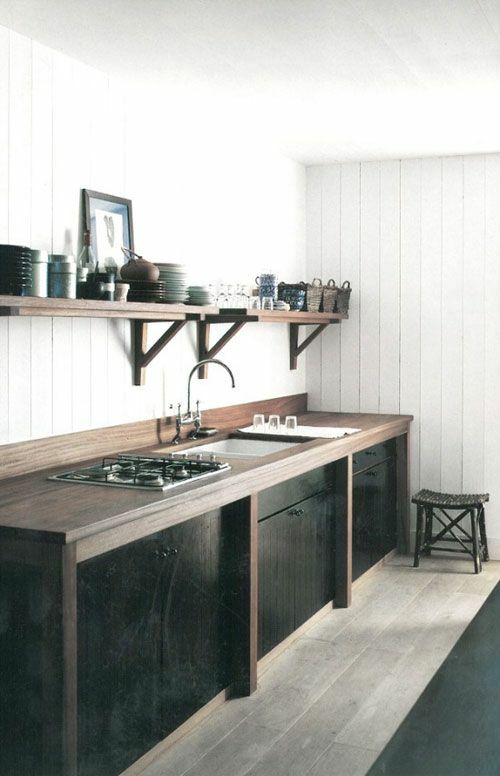 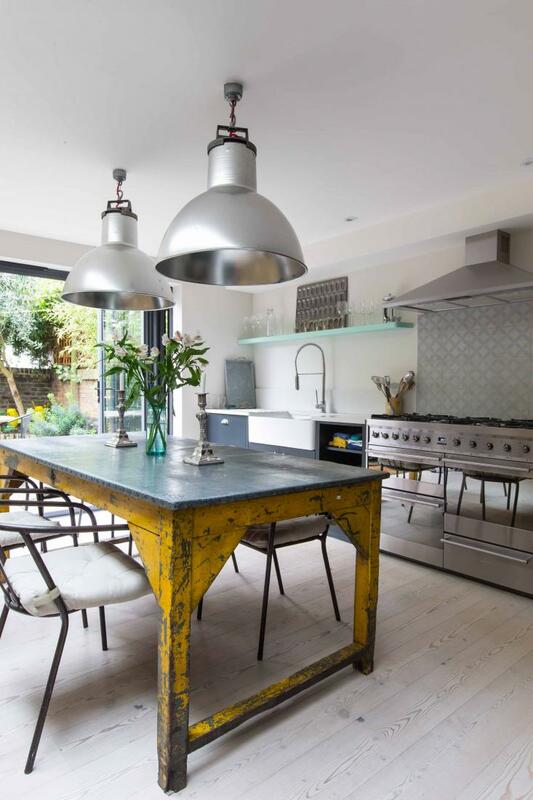 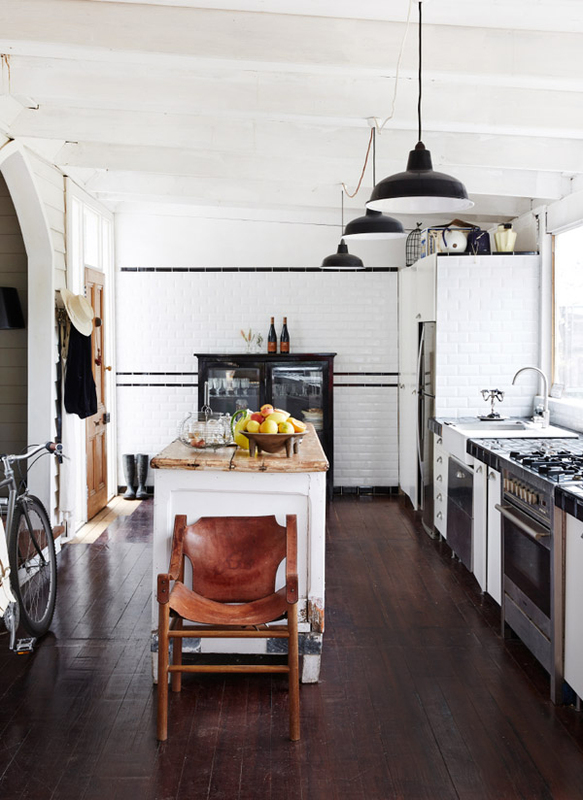 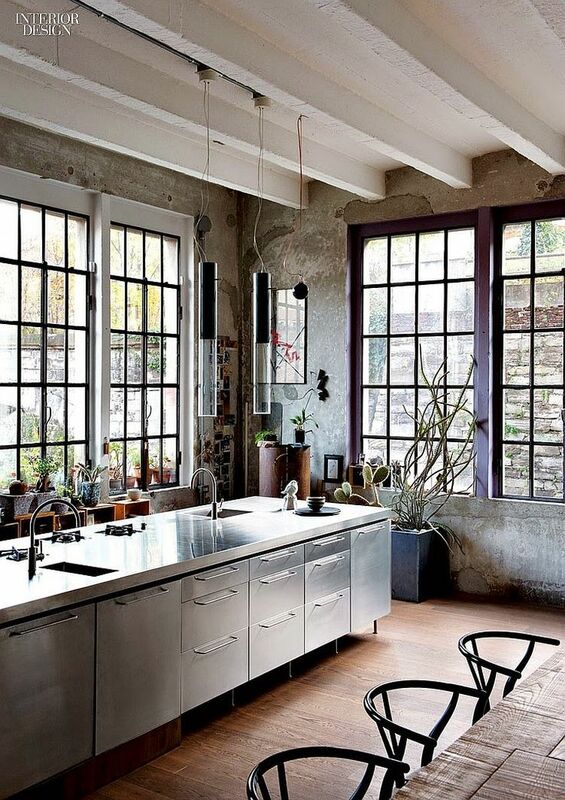 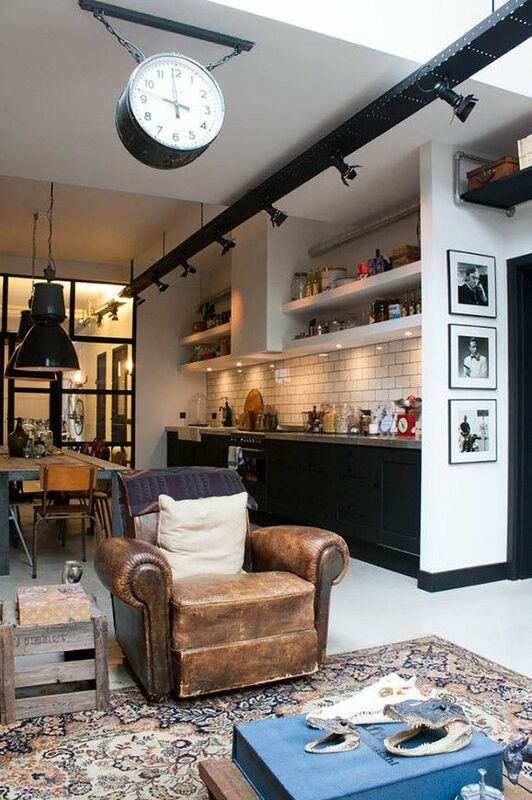 Love the industrial style kitchen in this home in England. 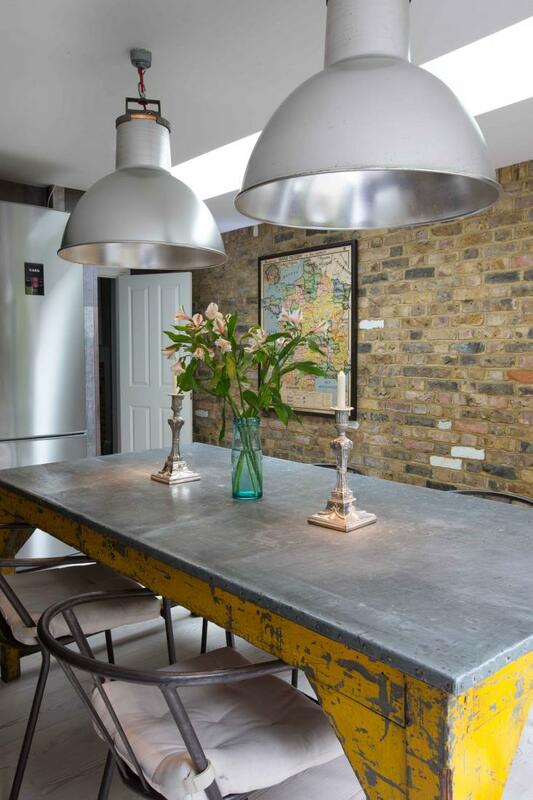 The lights are just perfect over the metal table with a fun punch of yellow! 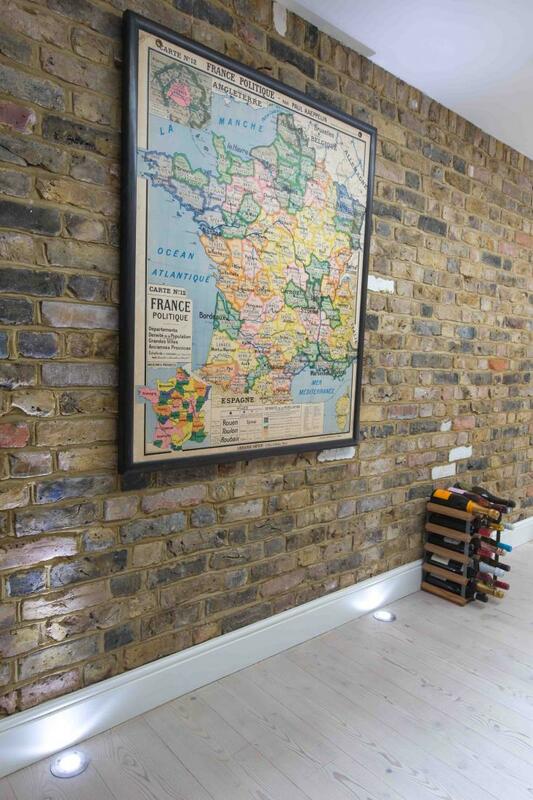 The map is a great touch in the kitchen pulling in some other bright colours. 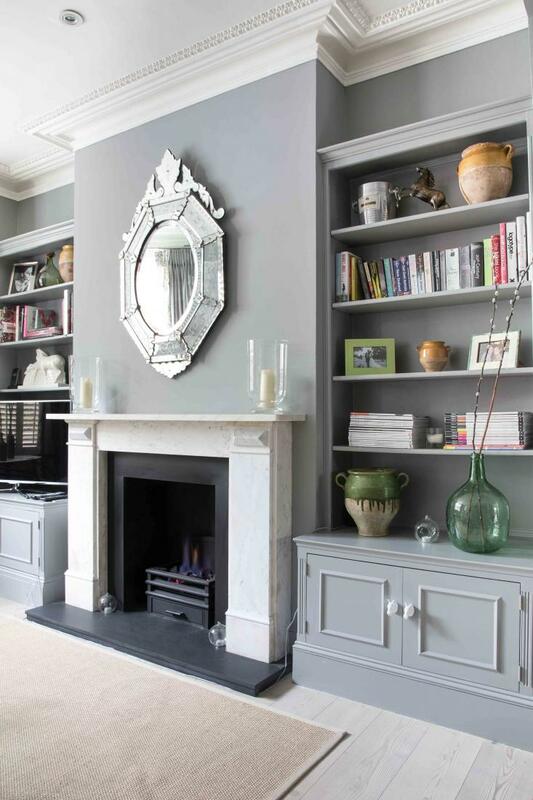 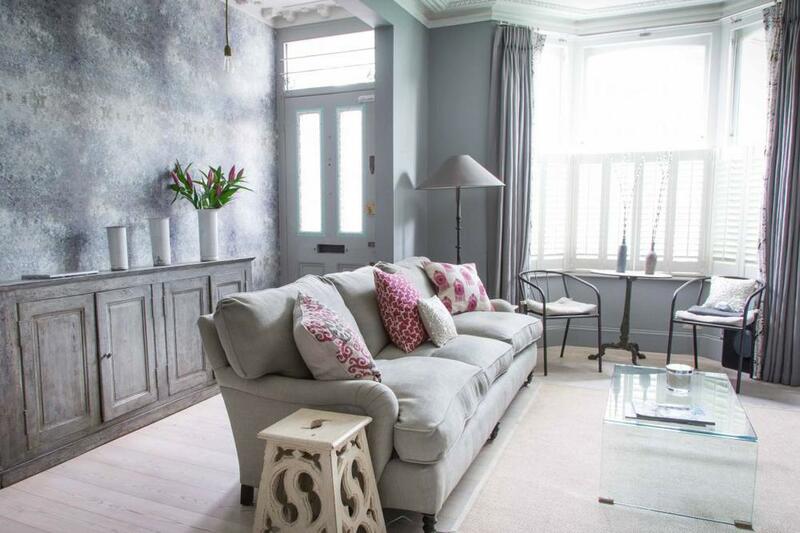 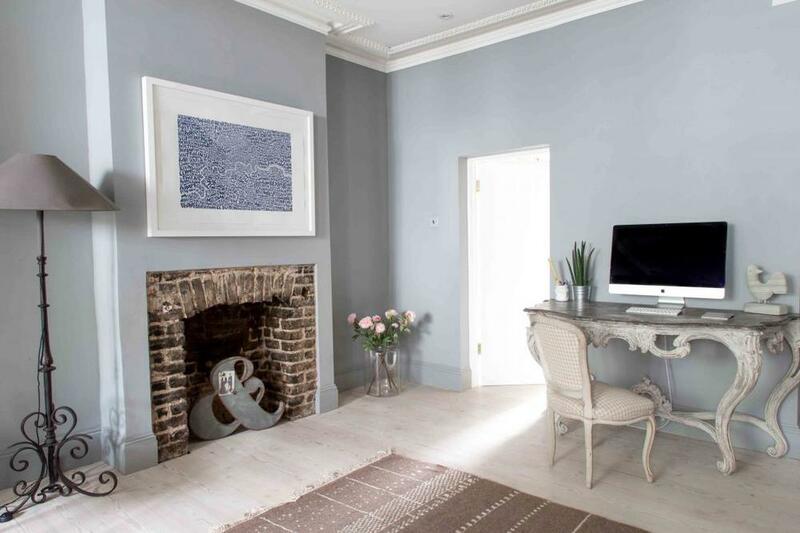 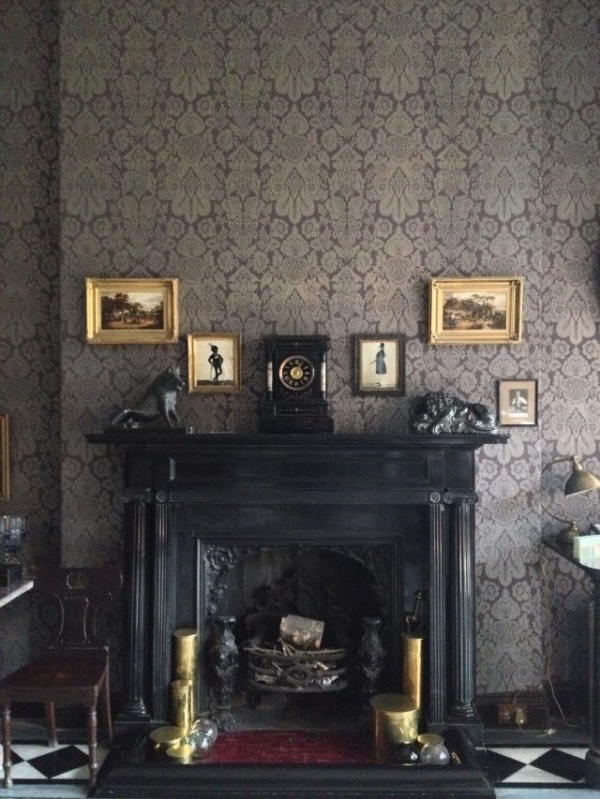 The living is all muted greys and pastels with a wonderful wallpaper in the entry. 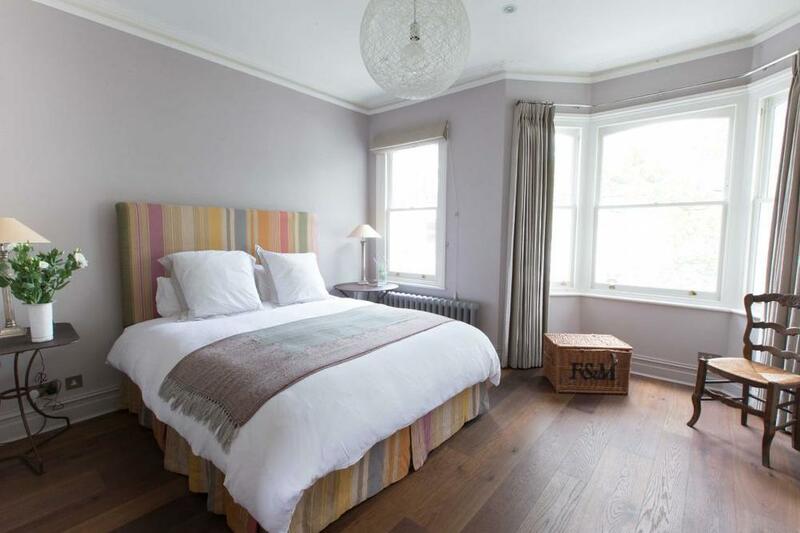 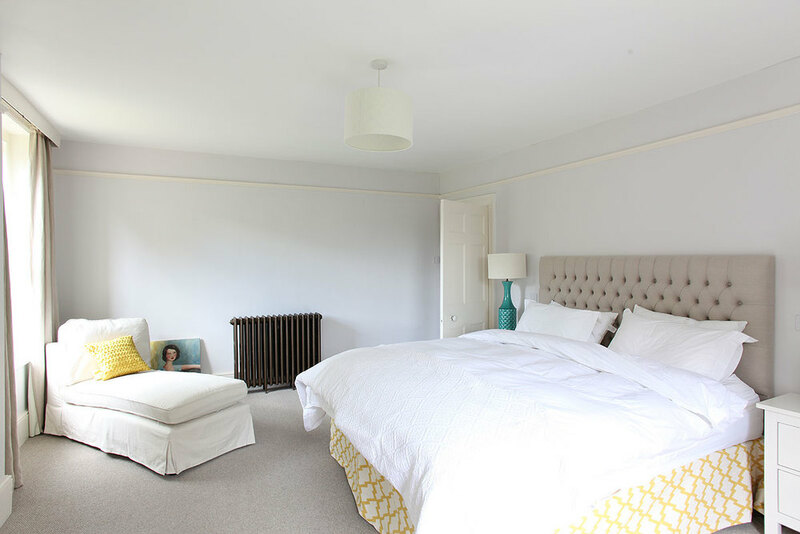 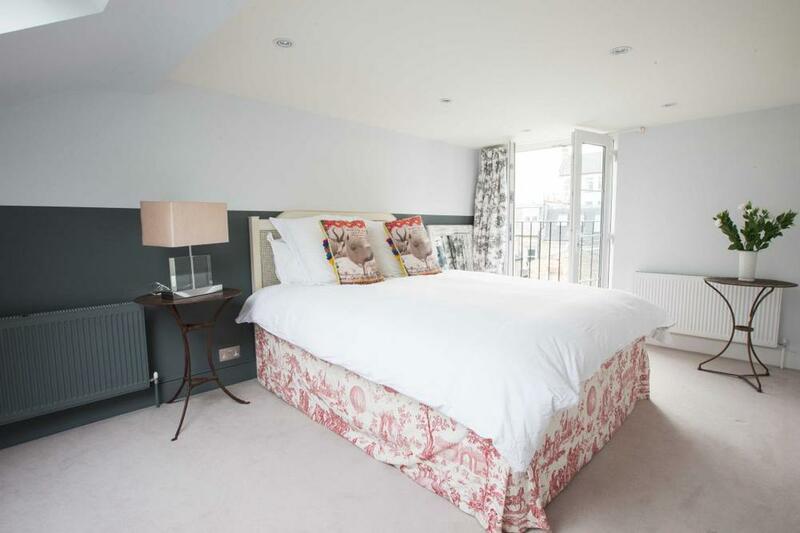 The grey on the walls is great in the bedrooms with the colourful headboard and skirt in both rooms.